What does the price of Chillin' the Most Island Jam include? The following are not included in the price of your vacation, however, Resort Credits may be used on some, if applicable. Getting involved in the pre-sale is easy! Register at kidrockbeach.com/presale. Everyone must register for the pre-sale, including all past CTM Cruise guests, by end of day Tuesday, September 11. You will be emailed an Earliest Booking Date by the end of Wednesday, September 12 and be able to book as early as Thursday, September 13. If you register for the pre-sale after September 11 you will receive an Earliest Booking Time by end of day Wednesday, September 19. The pre-sale ends and festival packages are open to the public on Friday, September 21. Everyone must register for the pre-sale! Of those who register, priority will be given first to those who sailed on one or more Kid Rock Cruise, followed by Kid Rock Cruise 2018 waiting list and canceled guests, followed by all new guests. Earliest Booking Times will be spread throughout several days so that we may provide you the best possible guest service experience as you make your reservation. Chillin’ the Most Cruise Alumni will be given the first chance to book. Your Earliest Booking Times are assigned in order sorted by most times on Chillin’ The Most Cruise, then by most recent year of sailing, then by earliest booking date for your most recent cruise. Chillin' the Most Cruise 2018 Waiting List and Cancelled guests will be given a chance to book next. This group's booking order is determined by the date you booked your canceled 2018 reservation or waiting list entry. New Chillin’ the Most Flyin’ High Island Jam guests (those who did not sail on a cruise) are the final group. Earliest Booking Times will be randomized prior to being assigned. Please Note: Being a part of the pre-sale does not guarantee that rooms will be left for purchase when it’s your time to book. Is airfare included in the Chillin' the Most Island Jam package? No, airfare is not included in the festival package, but basically everything else is included! Sixthman will do everything to ensure your experience can't be beat from the moment you step off the plane at Punta Cana International Airport until Chillin' the Most Island Jam comes to an end. Sixthman Usernames: You'll need to login with (or create) a Sixthman Username to book. If you've vacationed with Sixthman previously or signed up for the Chillin' the Most Island Jam Pre-Sale you have a username. Recover forgotten login credentials here, or contact us or try our live chat for immediate assistance. If you or a guest needs a Sixthman Username you can create one while booking. Guest Permissions: If you were a Lead Guest on a prior event and are traveling with the same guests, your guests will be in a dropdown list for you to add to your room. If you're traveling with someone who has a Sixthman Username but has NOT traveled with you previously, have your guests login to their Sixthman profile and add your username to their 'Approved Lead Guests' list in the 'Guest Permissions' section. They'll then be on the dropdown list for you while booking. Booking your room is easy! You can book online at kidrockbeach.com/booknow, or over the phone by calling 877-379-9178. We know that 4 days in paradise might not be enough, so we’ve worked with the Hard Rock Hotel to get a special Chiller-only rate starting at $212 per person per night (based on double occupancy) for days before and after the Island Jam! During your extended stay, you’ll have access to the Hard Rock’s all-inclusive amenities! BEFORE: To reserve a room on May 3rd, 4th, or 5th and to view complete pricing, go here. AFTER: To reserve a room on May 10th, 11th, or 12th and to view to view complete pricing, go here. Both of these links will take you to the Hard Rock Punta Cana website where you'll book directly with Hard Rock at rates reserved just for our guests! Please Note: For your Kid Rock Chillin’ the Most experience, some room categories were renamed. For example, a "Stage Side" room is unique to just the event with musical programming. Please take a look at the below grid before reserving your additional nights as it will tell you what category your room would be considered during a standard Hard Rock Hotel stay. 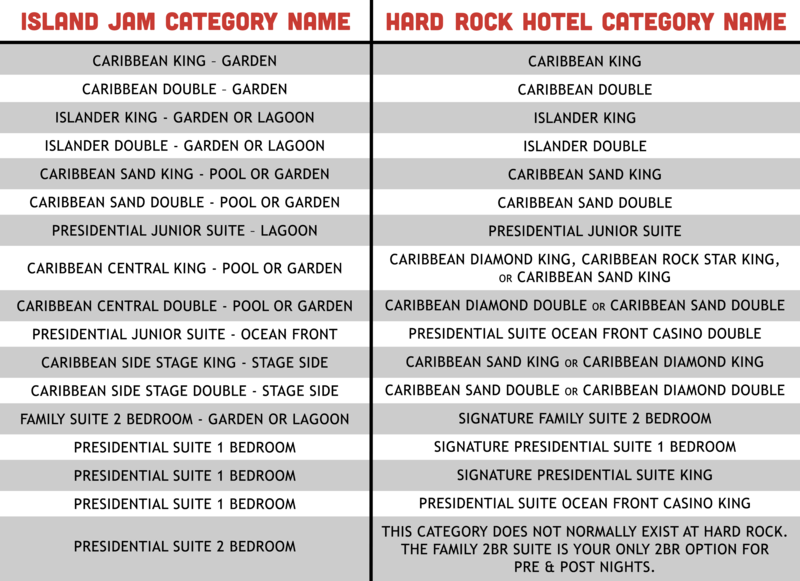 If your room category isn't available to reserve on the Hard Rock website, contact us. These rates are only available on May 3rd, 4th, 5th, 10th, 11th, and 12th. Our rates are not guaranteed outside of 3 days prior and 3 days after the event. If you are interested in a longer stay, book your other nights directly through Hard Rock. Standard resort operations apply during Pre & Post nights. The first Island Jam show will be the evening of the 6th and the last will be the evening of the 9th. Complimentary shuttle service from Punta Cana International Airport to Hard Rock Hotel and back is only included for guests arriving on May 5th or 6th and/or plan to leave on May 10th or 11th. If your travel dates fall on any other dates, you will be responsible for your own transportation. Go here to view recommended transportation options (taxis are readily available). We will also provide a direct booking link for private transfers closer to the event! Check In starts at 3pm. If you arrive before then you will be able to check into the hotel and use the facilities, but your room will not be ready until after 3pm. Check Out is by 12pm. You must be checked out of your room no later than 12pm. If your flight is later in the day, you will be able to use the resort's facilities until 6pm. Each guest needs a Sixthman Username to create, manage, or be added to a reservation. Create your username while registering for the pre-sale. If you have traveled with Sixthman previously or signed up for the Chillin' the Most Island Jam pre-sale, you have a username and will not need to create one. If you don't know your username, you can recover it here. You can also contact us and we will be happy to look it up for you (try our live chat feature or call us at 877-379-9178). Use your Sixthman Username to login throughout the year to update your personal information, make payments, add guests, or make changes to your reservation. To manage your reservation, sign in using your Sixthman Username here. *To review both protection plan coverage policy details, please click here. If you have travel insurance and need to cancel for a covered condition, you can make a claim with Travel Insured to recover any lost payments. There will be a variety of beers, wines, and liquors (including top shelf brands) included. Exact offerings are subject to change. What are the prices of Chillin' the Most Island Jam? Per person double occupancy prices start at $1999 for Caribbean, $2099 for Islander, and $2399 for Caribbean Central and above. All suites (with the exception of Royal Villas) can be reserved for a $300 per person deposit. You may view our full pricing grid here. Paid In Full Discount*: Reservations made through November 7, 2018 that are paid in full within 72 hours of booking will receive a 5% discount off room fare. The Paid In Full Discount will only apply if the entire reservation is paid for and is not available on a per person basis. Youth Discount: The event is recommended for guests 18 years and older. If you are interested in bringing children please contact us for child rates. Military Discount*: Guests who are active or retired military are eligible to receive a 5% discount off room fare for the entire room. To receive this discount, please email one of the following items below to kidrockbeach@sixthman.net after your reservation has been confirmed. Please blacken out your social security number before sending. Chillin' the Most Island Jam is sold in US Dollars and all charges incurred prior to the event will be charged as USD. Currency conversion shown on the website is for example purposes only. All pre-event payments will be processed as USD and non-USD accounts are subject to your bank’s exchange rate at the time of each transaction and are also subject to any foreign transaction fees of your bank. All resort charges will be listed and charged in US Dollars and non-USD accounts are subject to your bank’s exchange rate at the time of each transaction and are also subject to any foreign transaction fees of your bank. Hard Rock Punta Cana welcomes all guests. However, The Dominican Republic is considered to have a moderate risk of Zika virus transmission. If you are pregnant or could be pregnant at the time of this event we recommend you consult your physician regarding your travel plans. There is no minimum age for infants, but we recommend you consult your pediatrician before planning international travel with children under 6 months of age. You can find pricing and availability for Chillin' the Most Island Jam here. What are the age requirements for Chillin' the Most Island Jam? You must be at least eighteen (18) years old to create a reservation and accept the Lead Guest responsibilities. This event is recommended for guests 18 years and older. If you are interested in bringing children please contact us for child rates. Can I request to stay near a friend or family member's room? Payments can also be made via phone by calling Sixthman at 877-379-9178. What is the referral program for Chillin' the Most Island Jam? Did you know that you could earn $100 off of your room fare by referring friends to join you on Chillin' the Most Island Jam?! We’re so happy to add new members to the Sixthman family that your friend will also get a $100 discount on their room! The program ends 30 days prior to the event, April 6, 2019 or upon a sell-out -- whichever comes first. The referrer must be currently booked on Kid Rock Beach. Everyone who purchases a Chillin' the Most Island Jam package will have access to the event programming. If applicable, reservations are subject to a Lead Guest change fee of $299. No lead guest changes or transfers are permitted after March 7, 2019 OR once the event is on a waiting list, whichever comes first. ALL names must be received by March 7, 2019. Each reservation is allowed one free name change prior to March 7, 2019. Additional changes prior to that date are subject to a $50 administrative fee per change. Any changes, including adding unnamed guests made after March 7, 2019, but more than one week before the event are $75 per change. Any changes, including adding unnamed guests made within a week of the event are $100 per change. Changes or additions made within the week prior to the event must be done in person at check-in, and may incur a fee up to $299 per change. You may purchase travel protection while placing your reservation online or by calling Sixthman Guest Services at 1-877-379-9178 after your reservation has been placed. Travel Protection is sold per person and based of the amount you'd like covered (minimum coverage is the per person cost of the room plus all taxes and fees). You may also call Sixthman to request additional coverage for other travel, such as airfare. More information about accessible show accommodations to come. At time of booking, please discuss your needs with the Sixthman Guest Services team by contacting us! IMPORTANT: All guests are required to carry a valid passport, not expiring within six (6) months of the return of your trip. For information on how to get to the resort, please check out our Get Here page! A fixed Resort Fee will be added to your vacation package in the amount of $49 per person at the time of booking. Resort staff and drink gratuities are already included in the price of your vacation package. While you are welcome to extend additional gratuities at your discretion, these minimum service gratuities are agreed to be paid by you upon booking your room. *Offerings are subject to change. For all Resort Credit charges, a 20% service fee will be applied. The Service Fee can only be paid with cash, room charge, or credit card. Service fee cannot be paid with remaining Resort Credit promotion balance. Where can I use Resort Credits? While the amount that you receive for resort credit for a four day stay is fixed ($750 per room), the offerings vary for what the credit can be used on. When you arrive, talk to the Hard Rock Punta Cana Vacation Planners for help using your Resort Credits. What will the schedule of shows look like? On the 6th, programming will begin around 6pm. For the rest of the festival, enjoy all that the resort has to offer during the day, with light Kid Rock programming of shows and activities. Schedule in an afternoon power-nap and a quick rinse off to prepare for the jam packed nighttime festivities and shows. We'll announce more details of the schedule when we get closer to the festival! Can I attend the festival if I'm not a guest at Hard Rock Punta Cana? All guests attending Chillin' the Most Island Jam must have a reservation booked through Sixthman and must be staying at Hard Rock Punta Cana to attend the shows. There are no day passes or off-site passes available for this event. The dress code for Chillin' the Most Island Jam is very relaxed. We want you to be comfortable! We ask that you wear shoes and cover up over your bathing suit when dining in the restaurants. Fixed lens camera photography is permitted everywhere on property, but please refrain from flash photography and use of tablets, iPads, selfie sticks, etc. during shows. Use of drones, audio recording devices, professional cameras (video or still) or detachable lens cameras will not be permitted at performances. What can I expect for shows and schedules? Enjoy all that the resort has to offer during the day. Soak up some sun, see how many restaurants you can try for lunch, perfect your cannonball in each pool. Schedule in an afternoon power-nap and a quick rinse off to prepare for the nighttime festivities and shows. This is a four day Kid Rock Beach marathon. Let's go y'all. What is the smoking policy at Hard Rock Punta Cana? Where is Kid Rock going to perform? Where are the stages located? Kid Rock and other artists will perform for all Chillers on the main stage at Woodstock Plaza. You'll also get to check out shows on the smaller stage while chillin' in the Central and Eclipse pools during the day. Take a look at the resort map, here! The property is HUGE! How do I get around the resort? Available trams run 24/7, so feel free to rest your legs! Pick-up huts are located all around the property and loop every 10 minutes. Check out the map, here! Want to walk? Leisurely strolls are encouraged! Resort check-in begins around 3:00pm on the 6th and check out will be at 12:00pm on the 10th. ​​​​​​Arrival and departure times to the resort will be coordinated based on your flight time. Please know that if you arrive before 3:00pm on the 6th, you will still have access to resort amenities while waiting on your room. What time does the party end and I have to go back to real life? Sixthman can be reached at 877-379-9178 or at sixthman.net/contact. Please use the live chat feature on our website, contact us or call the Sixthman office at 877-379-9178. Cannonball Club is our way of inviting our cruising community to experience more than one Sixthman vacation per year. Any guest booked at full price* on Chillin' the Most Island Jam is considered a member of Cannonball Club and may book one or more Cannonball Club events at special reduced rates.